As last week story, Jesus knows that the time draws near that his enemies will set upon him. It's really weird why so many people wanted to kill a man that had healed and helped many. Leaders are jealous of Jesus' power; the traders hated his guts; those goodie two shoes hated that he mixed with "undesirable characters; and some like Judas realised that the Kingdom that Jesus meant is not a Kingdom on Earth. Hence they would like to see him dead." 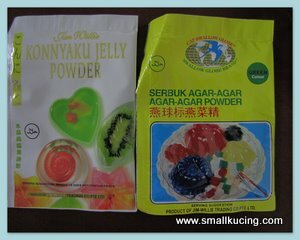 The other day, the time draws near for me too coz out of the sudden, Mamarazzi said wanna try making Konnyaku Jelly. Mamarazzi NEVER made Konnyaku Jelly before in her whole life. Wokay wokay...don't laugh. Mamarazzi memang old fashion. Normally she would use the good old Swallows Brand of Jelly to make. But the other day while we we at Tesco, she saw this Konnyaku (how to pronounce ah?) on offer. For RM5 plus, she gets three packets of the powder and a free plastic mould. The instruction says add some fruits. She added some Oranges in it. She remembered seeing in Elin's blog that and noted that she had made some very colourful fishes. Mamarazzi "kopi-ed". Hmmm...oppss...too much color...Nevermind...practice makes perfect. P/S : The time draws near too for the Biggest Books Sale in the World, BBWS. Today 16th is the last day of the sale. Catch it before it's too late. 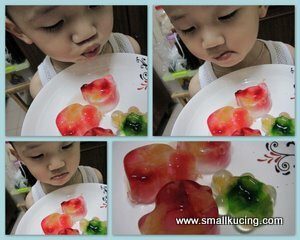 Cute colourful jellies, yum yum! 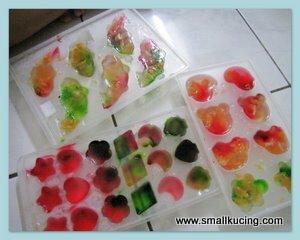 very nice and colourful leh those jellies. first time doing, already so good....so small kucing 'yao hao fuk'. my first attempt, not as nice. Very cute and colorful, nice. 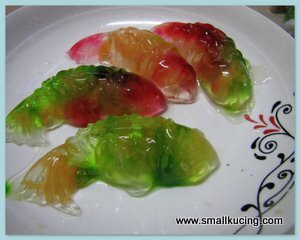 even agak agak, but the outcome tak agak agak woh... so colorful the fish jellies, how bout the taste?? Titik colour inside wan ah? Auntie tak reti... usually just make plain coloured wan den just taruk fruits inside.